the first time i heard about the cohen crazies was in 1998, sitting in my cousin cynthia’s living room in greenwich village. it was the first time i had met cynthia and her brother david, who was the one speaking of those cohen crazies. since then, the cohen crazies has become something almost mythical, seamlessly interwoven into our immediate family’s framework of collective familial memory. david and cynthia are my second cousins once removed – or, to make it simpler, the grandchildren of sadie cohen, the older sister of the above pictured anna, my great-grandmother. anna had a stroke in her 40s and spent most of my grandmother ethel’s childhood in a more or less invalidic state. so then, when david brought up the cohen crazies, in conjunction with a story about a female relative (i honestly can’t remember who) of the prewar era who did not leave the house for two years because she, well, had the cohen crazies, my mother (who was sitting next to me) and i of course immediately mentioned anna: she must have had the cohen crazies, too! well, maybe. though neither of us ever met anna and perhaps some of her crazies could be explained away by medical ailments and psychological trauma (the death of her second child), the stories that had been passed down about her not coming downstairs for weeks at a time or the strict rules she made my grandmother live by (no active playing! no walking on the same side of the street as a dog!) seemed maybe slightly nutty. this supposition of nuttiness was confirmed a year later, when we visited a girlhood friend of my grandmother’s in pennsylvania. mary said that it was never clear if anna really was an invalid, or if she was just a hypochondriac and a neurotic – she seemed to suggest the latter more than the former. after we first heard about the cohen crazies, we started talking about them all the time – speculating about their nature, if they’d been passed down to us, if they were something you could medicate now. for a while i thought i had the cohen crazies when my thyroid malfunctioned for a couple months when i was in college, and i manufactured a whole hypothetical chain of crazies to explain myself, finding a kind of solace in the idea that i had some genetic ailment of the sort that probably would have been labeled “hysterical” by dr freud. somewhat later, we decided that the crazies, seemingly exclusive to females in middle age, were probably a menopausal hormonal imbalance – something that is borne out by the fact that we don’t have any present day relatives locking themselves inside for two years in this current age of medication – and i suppose that maybe one day i can find solace in our family inheritance of hot flashes, though i think i’d prefer not to. these kinds of familial explanations and linkages are, of course, something i always find appealing and without the false thyroid hypothesis about the crazies, i am not sure what links me to anna besides our blood. i simply don’t quite know her well enough and i really don’t know her at all before she had the crazies, but then again, neither did my grandmother, her daughter, the gatekeeper of any anna-knowledge that has been passed down this far. 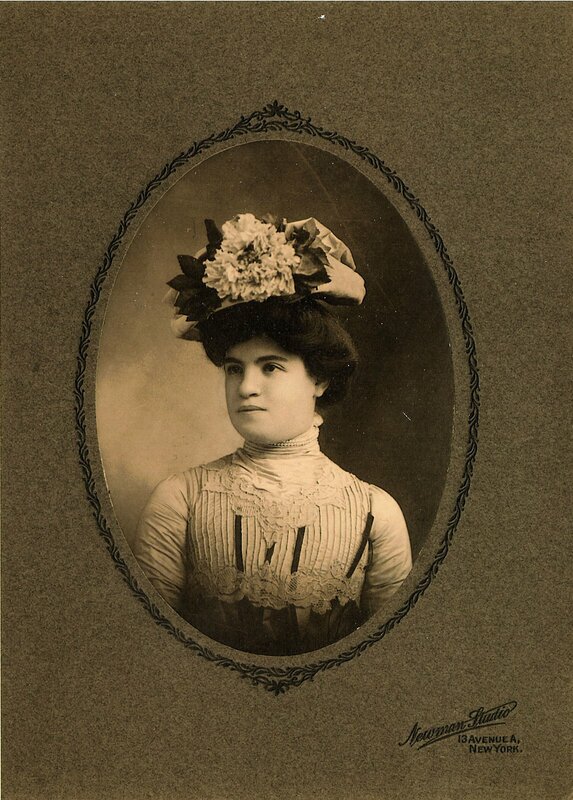 i sort of wish i knew her as a girl, or when this photograph was taken, probably sometime around 1905, near the time of her engagement and marriage to my great-grandfather max. the crazies had not manifested themselves then, but without them, i have no idea what constituted her character or her person at all. nothing. she was the daughter of a probably quite poor hebrew teacher named moses, the youngest of 5 children and born on the lower east side of new york city. i am sure she was happy to be getting married to max, a young man from a wealthy family in lemberg, austria who was going to take her away to the comparatively rural land of york county, pennsylvania, where he was working as a tobacco agent. she was considered very good-looking for her times and the story goes that she met max when he drove by and saw her sitting on a cousin’s porch in harrisburg, pennsylvania. she was so pretty, he had to go back to meet her, making it possible for me to be telling you this story right now. however. what went on in her head, what she liked to do, what she thought of manhattan or of york or of anything – these are things i can’t even guess at and teasing my sister about the cohen crazies does not really make up completely for that.